On our way east, the Girl and I paused at an overlook for the view. This is the Columbia River Gorge and it is a place I will return to, God willing. Sunday morning we got in a decent walk, then loaded out our gear. Or, rather, I loaded out our gear. There wasn’t much, so it wasn’t a big job. Breakfast wasn’t much — some rubbery scrambled eggs and a hard, cold, dry biscuit with a little canned sausage gravy. I saved back one of the sausages for the Girl. The free breakfasts are often worth what I pay for them. I’m occasionally surprised (as I was at the Oxford Suites in Portland), but not often. We headed out, taking Interstate 5 to Vancouver (back to nearly where we started from), then Washington 14 east along the Columbia River. The highway parallels the Interstate on the south side, but I hate driving Interstate Highways, except when I absolutely have to get there quickly. The U.S. and state highways are far more interesting. Washington 14 did not disappoint. I saw a lot of beautiful views of the Columbia River Gorge. 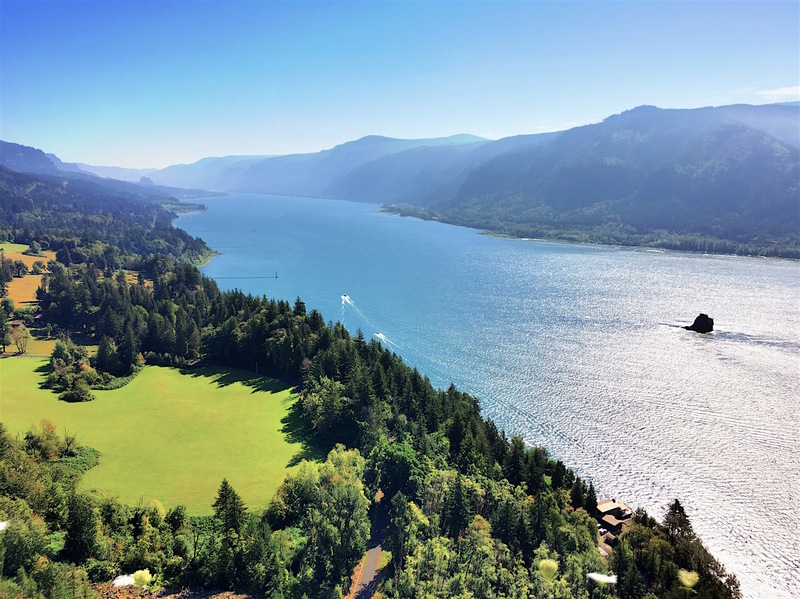 For this shot, I pulled off at the Cape Horn Overlook, dodging passing vehicles to get out of the rig. (The Girl stayed in the rig.) I managed a few captures of the view, paused a moment to take it in, and then we moved on. Along the way, I stopped near The Dalles to watch the windsurfers play. Some use a sail; others use kits. It was fascinating to watch them play, a discordant dance on the roiling surface of the river. My friend Jimmy was right about this place. It is a place I should return to with a much longer lens, much earlier (or later) in the day, and with a tripod for stability. I think some interesting photographs could be made here. There is plenty of subject matter to work with. It wasn’t long after that we drove out of the Columbia River Gorge. The landscape changed to a flatter, dryer world. The mountains gave way to plains, although the underlying volcanic history showed through the surface here and there. Then came the grind. It was time to simply finish the drive and get to my destination, Spokane. So, that’s what we did. The outside temperature was between 95–100F, so it was time to use the rig’s air conditioner. The Girl will overheat if it’s too hot. Eventually, we arrived in Spokane. I found us a place to stay. We found some food. We had a great play before the heat got to the Girl. We called it a day.